Cheery times at the Beringer winery. California’s classic wine country is always on the menu. With so much in Napa Valley to explore, Virtuoso advisors’ wealth of firsthand experience is key. From the town of Napa in the south to Calistoga in the north, the valley claims a chain of distinct communities, each with its own diversions and vibe, and to visit just one would be a shame. How to decide? Your advisor can help, but following are a few of our favorite ways to wine and dine your way through the valley. Threshold to Napa Valley and big brother to the region’s other wine villages, Napa (the valley’s largest town) bustles with cutting-edge art galleries, lively tasting rooms, and upscale dining venues such as Ken Frank’s Michelin-starred La Toque. WINE: In Napa, you’ll never be thirsty. Two must-stops along its tasting-room crawl are family-owned Stonehedge, home to handcrafted artisanal wines, and Uncorked at Oxbow, which offers private salons for personalized tastings and blending sessions. STAY: Highlights of Carneros Resort and Spa’s recent renovation include a new wedding events venue and updated family pool, along with a bar and outdoor terrace at its quintessential locavore restaurant, Farm. With 86 cottages and 10 suites clustered in tiny “neighborhoods” named for nature’s elements, the swank complex embodies the essence of the Napa experience. Napa Valley’s undisputed culinary capital, with more Michelin stars per capita than any other U.S. locale, Yountville personifies the California wine country lifestyle. Designated an official American Viticultural Area (AVA), the hamlet also houses The French Laundry, Thomas Keller’s storied pillar of New American cuisine and seasonal eating, and a bevy of other much-lauded restaurants, tasting rooms, and bakeries. WINE: You may want to linger all day at Cliff Lede Vineyards, where you’ll find blocks of grapes named for legendary rock tunes such as “Moondance” and “Dream On” (and corresponding “Rock Block” blends like Moondance Dream), along with a variety of tasting options. Walk-ins can partake in bar flights, but those with reservations (hint: call on your advisor) can opt for exclusive veranda table tastings or imbibe in the VIP tasting room called “Backstage,” which features signed guitars and a changing, rock-themed art exhibit. DINE: The French Laundry may be Napa Valley’s Mecca, but Keller’s Ad Hoc also delivers – albeit with a more affordable, less complex menu. “I’m also a fan of Michael Chiarello’s Bottega,” says advisor Malaka Hilton. “Everything’s good there, but don’t miss the branzino.” In homage to Napa’s Italian immigrant heritage, Redd Wood fires up hand-tossed pizzas, and sushi cravers can get an ultrafresh fix at R+D Kitchen. STAY: As California’s first LEED Platinum-certified hotel, 62-room Bardessono Hotel & Spa has led Napa’s trend toward sustainable tourism. Likewise, its restaurant, Lucy, celebrates quintessential farm-to-fork fare with an on-site garden. “You’ll also love the rooftop pool and the Murphy bed-style massage table that comes in each room,” says San Francisco-based Virtuoso advisor Lisa Baserga. Known as “Napa Valley’s Main Street,” this natural beauty can best be described as comfortable in its skin. 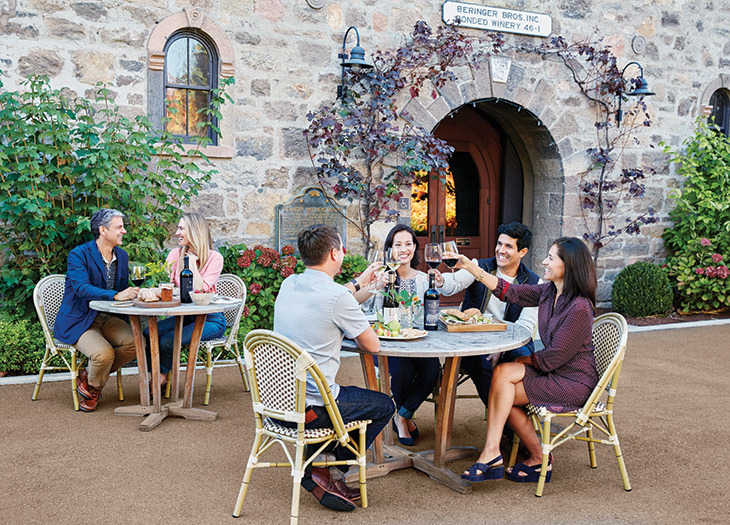 Home to a half-mile main strip lined with sycamore trees and a host of long-standing wineries – including Beringer, the valley’s oldest – Saint Helena has grown more chic and charismatic with age. Though it teems with history (Robert Louis Stevenson hung out here on his honeymoon), the town presents today as a well-heeled, modern wine village, festooned with the sort of shops you want to peruse: cookery stores, clothing boutiques, olive oil dispensaries, and artisan bakeries. WINE: To taste Saint Helena’s finest, says New Orleans-based Virtuoso advisor Lila Fox, have your advisor secure winery appointments with his or her go-to local driver-guide, who’ll have access to all the best wineries and owners. One suggested route: Begin the day at Ehlers Estate, then continue to Hall Wines, whose uber-stylish architecture complements the artistry they bottle. Later, ascend to Cain Vineyard & Winery, which overlooks the valley from the crest of the Spring Mountain district, for a guided vineyard hike and tasting. DINE: Arrive early to The Model Bakery – a Napa staple for nearly 90 years – for its famed oversize English muffins. For lunch, Fox sends clients to Farmstead at Long Meadow Ranch – she promises you’ll swoon over the pimento cheese deviled eggs. She also urges: “Don’t miss the dark chocolate caramels with fleur de sel at Woodhouse Chocolate.” Outdoor fireplaces and a walnut bar set the scene at Press, a farmhouse-styled chophouse where dry-aged beef grills over almond-and cherrywood and whose wine menu exclusively features local bottles. STAY: Meadowood Napa Valley’s 250 acres feel like a village in itself. The resort holds 85 cottage-style suites, tennis courts, a new spa (request the 3.5-hour vinotherapy treatment), a croquet field, and a golf course, but it’s most renowned for its three-Michelin-starred restaurant, one of only five in the western U.S. Located at the valley’s northern tip and less traveled than Napa, folksy Calistoga exudes an unpretentious, accessible ease. Home to Chateau Montelena Winery, famous for its win in the 1976 Judgement of Paris, it draws visitors with family-owned businesses, wine-centric cafés, and coffee shops decorated with poetry graffiti. Perhaps most defined by its mineral-rich geothermal springs and curative mud baths, available throughout town, Calistoga offers wellness with a direct connection to the valley’s fertile soil. WINE: A decades-old stone winery and an original Craftsman-style house-turned-tasting room comprise Frank Family Vineyards. The tasting room is open to the public. For a more whimsical experience, the Tank Garage Winery occupies a former gas station in which guests can sample stellar local wines amid pinball machines and vintage motorcycles. DINE: Join locals for breakfast (all day!) at cozy Café Sarafornia, where corned beef hash, salmon and eggs, and towering pancakes provide fuel for wine jaunts. For dinner, tuck into classic French, German, and Mexican dishes at Johnny’s, whose chefs make their own charcuterie and forage for local ingredients. At the bar, brioche bun sliders steal the show. 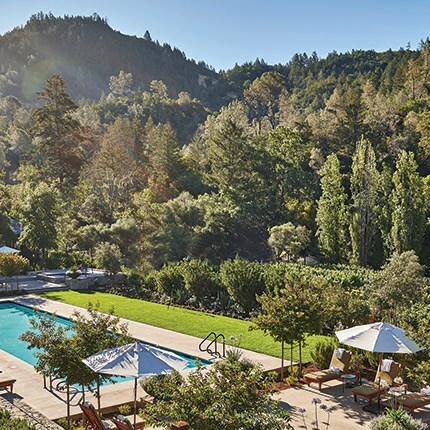 STAY: Eco-friendly, 89-room Solage lies a short walking distance from Calistoga’s shops and restaurants. Known for its Michelin-starred restaurant, geothermal bathhouse, and Mudslide spa treatment, the hotel also appeals to active oenophiles who appreciate its complimentary fitness classes and saltwater pool. “Solage’s Mercedes-Benz program allows guests to borrow from a collection of cars, including a convertible, for off-property excursions,” adds advisor Lisa Baserga. Calistoga Ranch offers 50 lodges within a 157-acre site marked by ancient oaks and a private lake. With mountain views, a host of hiking trails, and chef Bryan Moscatello’s seasonal menu at The Lakehouse restaurant, the resort firmly roots guests in the setting. Highly recommended: the ranch’s on-site beekeeping course, guided meditation walks, and Calistoga-inspired Water Therapy treatment in the spa’s healing mineral pool.